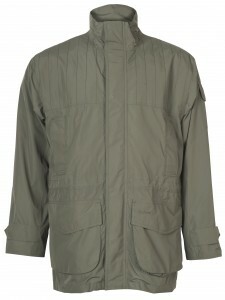 It probably isn’t possible to design a shooting jacket with the versatility and durability to be suitable on any day in the field, regardless of the conditions, and as a result most shooters end up with at least a couple of jackets to cover the various scenarios, but when a good jacket generally now costs upwards of £300 this isn’t an option for many people. A jacket that is suitable for early season grouse or partridge shooting on a muggy and thundery day, when you need to be smartly turned out, just isn’t the right jacket for a day rough shooting on a freezing December morning.However with the Sporting Featherweight Barbour have developed perhaps the closest thing to an all rounder that I’ve seen to date. The design brief for the Barbour Sporting Featherweight was to make the lightest shooting jacket on the market, which the jacket really is. Using highly technical lightweight fabrics they’ve cut out the weight without sacrificing the cut, style and features of a traditional jacket. On a warm muggy day, with only a threat of rain you could even stuff it in game bag, without it being a hindrance to carry. some of the coldest days shooting I’ve experienced and been told they are plenty warm enough. To complete the appeal of the Sporting Featherweight, Barbour have managed to keep the price bellow £250, which is fantastic value, especially when it is so versatile. Barbour Shooting Jacket, Barbour Sporting Featherweight, Sporting Featherweight. Bookmark. Does this jacket come with a detachable hood? Is it also called shooting featherweight jacket? The Sporting Featherweight by Barbour is no longer available from us but I have been able to source some information and can confirm that it was available with a removable and detachable hood. In terms of wording, the shooting featherweight jacket may be the same product but this would depend on the manufacturer’s code provided.